He was my grandfather. My younger sister and i visited this very grave site years ago and were quite touched/ My mother is still alive and living in California and can relate more information regarding my Grandfather. Please share some biographical information with us. I am the grandson of Rabbi Joshua Chosak. His son Saul Chosak is my father. 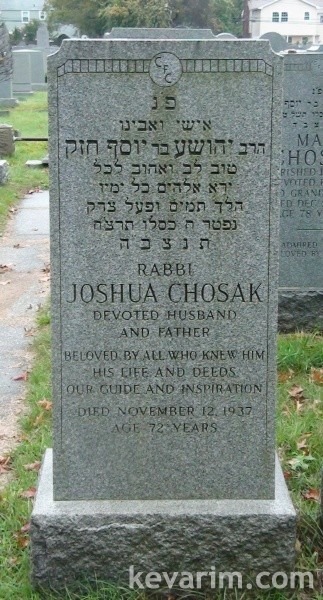 Rabbi Joshua Chosak died in 1937, ten years before I was born. Nevertheless I feel that I know him personally. My father told me many stories about Rabbi Joshua’s kindness and good deeds. And Rabbi Joshua Chosak’s daughter, my MUCH loved and honored Aunt Freda Silver is alive and well in California to this very day. She regales me with stories of her childhood and her memories of her Abba (father). I am truly blessed to have Rabbi Joshua Chosak as grandfather and Freda Silver as my Emah Shay-nee (My Second Mother). I would GREATLY appreciate it if you could tell me how I could find the NYT obit for my grandfather Rabbi Joshua Chosak. His daughter Freda Silver, now 87, indeed remembers that he was a Rosh Yeshiva in the Voloziher Yeshiva in Brooklyn. It would be a true mitzvah if I could show the article to her. Even though he is niftar over seventy years he is still strong in her lev (heart). You do a WONDERFUL job on this website. All chavod to you and of course Chag Chanukah sameach. Was he a Rosh Yeshiva of a Volozhiner Yeshiva in America or was he the Head of fundraising for the Volozhiner Yeshiva in Volozhin Europe?